Nine young composers, ranging in age from 19 to 26, have been named winners in the 51st Annual BMI Student Composer Awards. Frances W. Preston, BMI President and CEO, announced the decisions of the jury and presented the awards at a reception held June 13 at the Plaza Hotel in New York City. Milton Babbitt, Chairman of the awards, and Ralph N. Jackson, President of the BMI Foundation, Inc. and Director of the awards, joined in the presentations. The 2003 BMI Student Composer Award winners are: Mason Bates (age 26, studies at the University of California Berkeley), Ben S. Jacob (age 26, studies at Indiana University), James D. Norman (age 23, studies at the University of Texas at Austin), Robert Janusz Pierzak (age 19, studies at Ithaca College), Joel Puckett (age 25, studies at the University of Michigan), Joseph Sheehan (age 22, studies at Indiana University), Nathan Shields (age 19, studies at the New England Conservatory of Music), Jeff Stanek (age 19, studies at Indiana University) and Dan Visconti (age 21, studies at the Cleveland Institute of Music). The BMI Student Composer Awards recognize superior creative talent and winners receive scholarship grants to be applied toward their musical education. More than 1,000 manuscripts were submitted to the 2003 competition from throughout the Western Hemisphere, and all works were judged under pseudonyms. Cash awards totaled $20,000. In presenting the Awards, Preston said: "We are proud that the first 50 years of the Student Composer Awards have been so wonderfully successful in discovering and encouraging some of the world's most talented young composers. Today, as we begin the second half-century of these awards, we are inspired by the talent and dedication of our young winners who show so much promise for the future." Joseph Sheehan was named the winner of the 2003 William Schuman Prize, which is awarded to the score judged "most outstanding" in the competition. This special prize is given each year in memory of the late William Schuman who served for 40 years as Chairman, then Chairman Emeritus, of the BMI Student Composer Awards. Additionally, special Carlos Surinach Prizes, underwritten by the BMI Foundation's special endowed fund, were awarded to the two youngest winners of the competition, Robert Janusz Pierzak and Jeff Stanek. 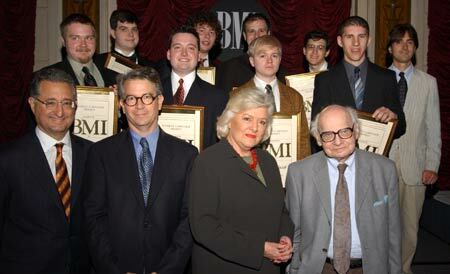 The distinguished 2003 Student Composer Awards jury members included Margaret Brouwer, Michael Daugherty, Mario Davidovsky, Christopher Rouse and Joan Tower. The preliminary judges were Shafer Mahoney, David Leisner and Bernadette Speach. BMI has given 477 scholarship grants to young composers over the years, and many of today's most prominent and active classical composers received their first recognition from the BMI Student Composer Awards. Eleven former winners have gone on to win the coveted Pulitzer Prize in Music. The BMI Student Composer Awards competition is co-sponsored by BMI and the BMI Foundation, Inc.